When the time comes to apply for credit cards, a new car, or even a first home, attention turns immediately to a consumer’s credit score. Though many might think that this simple number is unfair and an overly simplistic look at their financial performance, lenders take the credit score extremely seriously. Before even applying for any loan product, it’s a good idea to know exactly what your credit score is and what certain credit score ranges mean in the world of consumer lending. Each range has major implications in terms of approval, rates, limits, and more. Consumers who currently have a credit score below 630 are typically considered to be “subprime” borrowers by today’s lenders. This means that they’re not the prime, or ideal, people to be lending money to for a credit card, new car, or new home. In many cases, people with a score lower than 630 will find it virtually impossible to get a credit card, and they may find that auto loan rates offered to them by dealers are between 15 and 25 percent on average. Most banks simply will not originate a mortgage for a consumer who has a credit score below 630, either, which represents a significant reduction in overall purchasing power. Consumers in this category should be working toward fixing their credit profile. Advancing beyond the 630 threshold opens up a variety of new options to today’s borrowers. This is considered a decidedly “average” score range, meaning easier qualification for entry-level credit card products, lower rates on auto loans, and the first opportunity to obtain a mortgage from a major lender. Consumers in this group will find that their interest rates decrease as their score goes up and, at the upper tier of this group, they’ll begin to enjoy offers that border on “prime” status. Even so, this group is sometimes still classified as subprime by mortgage underwriters and some car dealers. As consumers edge closer to the 700 mark, they get increasingly better offers from major banks. Most consumers in the “good” credit score range get interest rates below 5 percent on a new car, and below 6 percent on a new home. People in this range will have very few problems obtaining new sources of credit, including prestigious credit cards from the likes of American Express, personal lines of credit, personal loans, home mortgages, and much more. While this is not the top tier for today’s consumers, it affords them many of the same opportunities at only slightly higher interest rates when compared to those who have a score in the “excellent” credit range. 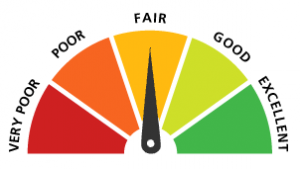 Credit scores typically top out at either 800 or 850 depending on the type of score being provided, and consumers in the “excellent” score range often come close to hitting the ceiling on their overall credit score and the health of their financial performance. In this range, borrowers are almost always welcomed with open arms for any product they wish to obtain. People in this score range get the largest credit card limits, are offered the lowest rates on new cards, and might be invited to apply for exclusive rewards cards that simply are not available or even offered to those with a score outside of 720. Borrowers in this group have a good chance of qualifying for no-interest auto loan financing, with the average rate hovering around 3 percent at most dealers. They’re also likely to be approved for a mortgage at the lowest current market rate, and may even qualify to purchase a second home as an investment property due to the higher score they’ve achieved. Credit scores can always be improved, though the process can sometimes be slow and arduous. With great spending habits and debt management skills, today’s borrowers can move up the credit ladder and eventually qualify for the best rates on every card they own and every purchase they wish to make.